Up to 400 ‘Kamov’ helicopters could soon be manufactured in India through a joint venture company owned by Rosoboronexport, Russian Helicopters, and Hindustan Aeronautics Limited, including some for export to third countries. 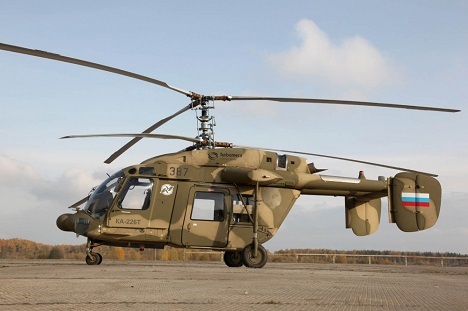 The Ka-226T ‘Kamov’ helicopters could soon be manufactured in India through a joint-venture enterprise owned by Rosoboronexport, Russian Helicopters, and Hindustan Aeronautics Limited (HAL), RBTH learned from an Indian military source, who wished to remain anonymous. “We are talking here about the production of at least 400 helicopters over the next 10 years, including some for export to third countries,” he said. The source declined to specify the cost per manufactured aircraft, saying “this will be determined when the final agreement is reached”. According to the PTI News Agency, the Indian government’s Defence Acquisition Council (DAC) gave an initial clearance for around 200 helicopters, and state-run HAL is a "front-runner" for partnering with Russia. "HAL is the front-runner as of now. Talks would be held now to finalize the contract and work out the modalities," the military source said. Sources also said that the Indian Navy's plan to procure over 100 Naval Utility Helicopters is on track and is a separate process for which the Request for Proposal is in the last stage of finalization. India has a fleet of Kamov Ka-28 anti-submarine warfare (ASW) helicopters and Ka-31 radar picket helicopters, but many of the former are in need of an upgrade.